Random House Books for Young Readers, 9780385386739, 208pp. The action is on the page, on your device, and out of this world! This multiplatform series is part sci-fi, all action-adventure. And you don't have long to wait—six books are coming all in one year! Earth is in danger! The only thing that can save our planet are six essential elements that can fuse into a new source of clean energy. But the elements are scattered throughout the galaxy. 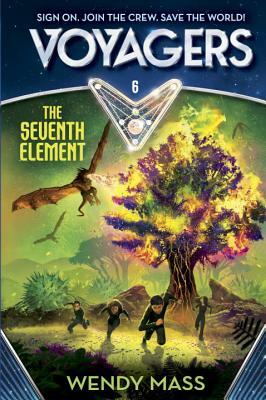 And it’s up to the Voyagers—a team of four remarkable kids and an alien—to gather them all and return to Earth. The Voyagers have made it to the last planet. If they complete this mission, they can finally go home. But they’ve been in space a long time, and it’s starting to take its toll. When one of the crew falls deathly ill, the race back to Earth becomes even more urgent. They just have to combat fire-breathing dragons and an evil alien clone out to sabotage their every move. No big deal. At least the Voyagers have almost every element they need. Only one more to go—six elements to make the Source and save the world. So why is there a space in the Element Fuser for a seventh? WENDY MASS is the New York Times bestselling author of fourteen novels for young people (which have been translated into fourteen languages and nominated for sixty-eight state book awards), including A Mango-Shaped Space (which was awarded the Schneider Family Book Award by the American Library Association), the Twice Upon a Time fairy-tale series, 11 Birthdays, The Candymakers, and 13 Gifts. Her latest books are Space Taxi: Archie Takes Flight and Pi in the Sky. Wendy tells people her hobbies are hiking and photography, but really they’re collecting candy bar wrappers and searching for buried treasure with her metal detector. She lives with her family in New Jersey. Visit her at wendymass.com.